Keshav Chawla is excited and honoured to represent DECA Ontario as the Media Coordinator for the 2018-2019 year. Keshav is currently a grade 12 student attending Markville Secondary School in Markham. 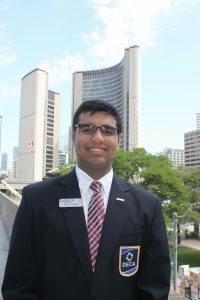 He has enjoyed being a part of DECA since grade 9, representing Ontario on the international stage. Keshav has served as the President of his local chapter ensuring that all members were ready for competition. His favourite part of DECA has been meeting all the unique people at DECA events throughout the year, and he looks forward to meeting and helping even more DECA members this year. Apart from DECA, Keshav is involved in the Transition Activity Council at his school, helping grade nine students become accustomed to high school. Additionally, he is involved in numerous youth organizations including Project 5K and Network Nights, which focus on promoting youth events and volunteering in Toronto. He enjoys teaching children how to ski during the winter. During his spare time, Keshav enjoys reading books, watching musicals, dancing, and following the news. Keshav is ready for DECA Ontario’s 40th year! If you have any questions, concerns, or if you are looking to talk, he encourages you to reach out through social media or by email at keshav@deca.ca.